A seamless shopping experience no longer means having your bags carried to your car. In today’s mobile world, customers expect to shop across every device and platform. When making a purchase, they might see a Facebook recommendation on their tablet, research a review from their laptop, and finally purchase on their smartphone. Given this new reality, companies need to engage customers in a rich, seamless experience regardless of device, location or platform. This is not to say organizations should forget about the still-sizeable percentage of the population that prefers to use laptops and desktops. 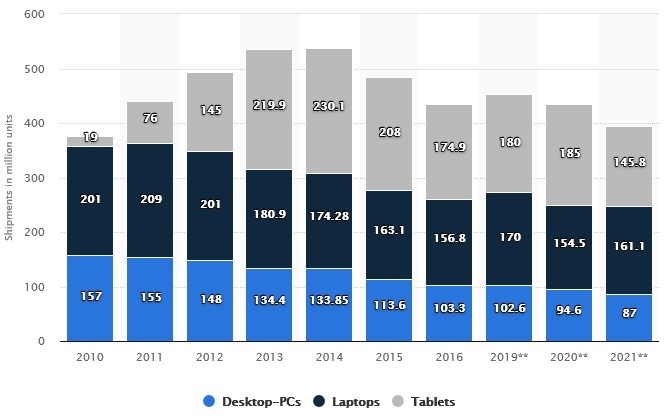 The graphic below (source) shows that while the number of worldwide desktop computer shipments is steadily decreasing, millions of people will still be using them in 3-5 years. The multi-device world presents companies with a dual challenge: to offer customers a rich experience, and to ensure this experience is seamless regardless of device or location. Black Crows is a ski equipment and apparel retailer based out of a resort area in the French Alps. Black Crows wanted to reach more customers with a new mobile ecommerce app. In the process, it wanted to: improve online conversion rates; optimize and enhance the customer’s mobile experience; and add multilingual and multi-currency support to reach international markets. Black Crows partnered with the team at Rangle.io to build an industry-leading web app that works across all platforms and devices. The customers’ buying journey is now a clean and enjoyable one, from the app to an intuitively designed homepage to a pain-free shopping cart checkout. The app offers a seamless omnichannel shopping experience regardless of platform, device, location, language, or currency. In a few short years, Rangle.io has empowered more than 300 companies through modern web development processes and software. To find out more about exactly how Rangle.io has helped these companies, visit Rangle Work. To learn more about Rangle.io, visit their website.